The last time “This Ole House” came up, a commenter on ILM quite rightly pointed out what I somehow hadn’t twigged – that it’s a song about dying. Of all songs on that theme, it’s surely one of the most stoical in its way – a joyful “whatever” in the teeth of advancing decrepitude. Liveliness was about all Shakin’ Stevens had going for him, but goodness he worked it. Shaky sidesteps new wave and new pop and reaches back to the rock’n’roll revival that played such a part in the mid-70s’ charts. That had a cabaret tinge and so does he, but there’s an energy in his pastiche that – at this stage anyway – keeps it bearable. His other great advantage over fellow revivalists was knowing how to present that energy on video – on the clip for “This Ole House” he’s in perpetual motion and as the song cuts from room to room to roof it’s like Shaky’s dancing with the house itself. God, I’d forgotten about “Marie Marie”. That actually was rather good. That’s a shame, I thought the image of such a gig on a rocky outcrop on Dartmoor would have been quite something. Mind you, the thought of Danny Baker having some kind of credibility also seems quite wierd :-) I say that as a fan of him, but he does seem a long way removed from that era now. “Sprightly” and “bouncy” are two words used upthread, and they sum this up nicely. A great one for jumping around to at student discos when you’re none too self-conscious (see also “Antmusic”) and a lot of fun. 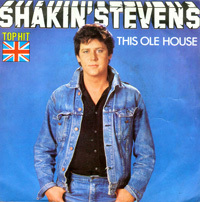 So is the vid of Shaky dancing around the ole house in question, even if the backing singers get a bit cheesy. As I mentioned yonks ago (and got spoiler-bunnied for it) in I can’t remember which thread, Shaky and the Sunsets actually predated the rock’n’roll revival of the 70s and went back as far as the time Sha Na Na were playing Woodstock. I’d forgotten before looking it up just now that he was also in the West End production of “Elvis” in the late 70s. With that kind of dues-paying, he deserved his time among the biggest pop stars in the country, and if he did become showbiz, he was entitled to. Bit of an ornery old bugger though, by all accounts. So, a respected cult figure consciously switches tack in order to become a kiddie-friendly mainstream pop star… I wonder whether we’ll be finding another such example in 1981? I can’t believe you only gave this 4 – ‘This Ole House’ is one of the greatest number ones ever. Actually for a 4 (or similar from most commentators) this record has generated a lot of positive comment – I guess partly that stems from the fact that Shaky had paid his dues and was a credible artist with a genuine belief in what he was doing. Meanwhile, Roxy Music’s one and only appearance on Popular has generated a considerably less positive response on the whole. Who’d have thunk it? Wretched dross with a tired old rock ‘n’ roller, polluting the airwaves with his sound and the TV with his faded denim. This makes Captain Sensible’s “Happy talk” seem classy in comparison but the saddest thing of all is there was much worse to come from Shaky. I just felt sad what becomes of our heroes…poor SS, although he was no Adam Ant, deserved better! As a closet New Romantic at the time I could not believe this was No 1. It was by far the worst record in the charts so how could it top the pile over classics like Reward, Einstein A Go Go and Planet Earth ? I saw Shaky as a big threat (quite rightly as it turned out) to my hopes for the future charts being dominated by moody melodramatic synth-pop He was the bubble-burster on a par with General Galtieri a year later who destroyed my political hopes for the SDP. I never forgave Shaky for this. He was the bad fairy of the 80s marring many an otherwise classic line up on TOTP with his stupid dancing like a middle-aged embarassing uncle turning up at his neice’s birthday party. Of course at this distance I can appreciate that he was a very professional and hard-working entertainer who appealed to an entirely different pre-teen demographic from the rest of the charts. His records achieved high positions because he had no real competition for so long; they came through the middle when sales to teens were split between so many other artists. When SAW came along and targeted the younger kids with Kylie and Jason he was finished and really he was the lesser of two evils. #28 and 31 – ‘Hot Dog’ and ‘Marie Marie’ were both Top 30 hits in 1980 but there was another single between those two and ‘This Ole House’ – the airplay-only hit ‘Shooting Gallery.’ I remember that one but not ‘Hey Mae’ which came out in the spring of 1980, after ‘Hot Dog.’ Wiki states that ‘Hey Mae’ got to 83 and ‘Shooting Gallery’ 79, although I thought the published Top 100 only appeared for the first time in 1983? As good a place as any to link the latest TPL update, on the last K-tel compilation (but not the last album on K-tel) to go to number one: http://nobilliards.blogspot.co.uk/2013/06/various-artists-chart-hits-81-volumes-1.html (as “This Ole House” is the last track). Re-reading this thread on the back of TOTP ’81 on BBC4, I note Mike’s reminiscence at #26. Shaky visits a girls’ boarding school dorm after lights-out to make sure they’re all tucked up … on Jim’ll Fix It?! Might have seemed OK when Mike posted that comment in 2008 but you shudder now. The boarding school Shakey girl was in my class in primary school at the time! As far as I know she was unscathed and enjoyed the whole thing (the rest of us thought it was pretty exciting, if not exactly cool). But obviously it has given me some pause for thought in recent years. Hmm. Closer inspection of the thread reveals that it was me who introduced the Jim’ll Fix it story in the first place. As you were.